Surfing the Web proved to be helpful beyond our wildest expectations because we found a site called �Big Apple Greeter� (http://www.bigapplegreeter.org/). Their �Welcome� page contained words that were music to our virtual ears: A free public service that helps visitors discover the hidden treasures of New York City. That was exactly what we were hoping to find. Now, our job was to decide what areas we wanted to explore. The Big Apple Greeter site contained a visit request form that we filled out. We were surprised how quickly they matched us up with a Greeter. After we exchanged a flurry of emails with our Greeter, Dave, he focused our attention on a particular area we would explore together. After deciding where and what we wanted to see and photograph, we packed our comfortable walking shoes for Manhattan. 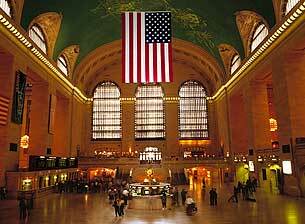 We arrived early at Grand Central Station, eager to begin what was to be the most exciting and enlightening New York experience yet. We followed Dave, a seasoned subway rider, up and down the stairs and through the turnstiles, finally boarding one of New York�s newest subway cars to Brooklyn. 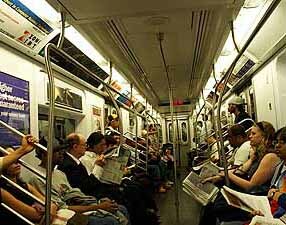 Dave commented that these new cars have more room for �break-dancing� in the center aisle�of course only during non-rush hours. Our train took us underground for a short time and then lifted us up as if by magic across the East River with a view of the Brooklyn Bridge, the first suspension bridge ever built. Our first stop was Brooklyn Heights. In the days and weeks following September 11th 2001, the residents of Brooklyn Heights placed many memorials along its Promenade to commemorate the tragedy of that day and to remind everyone of the gaping void across the East River in Manhattan left by the destruction of the Twin Towers of the World Trade Center. 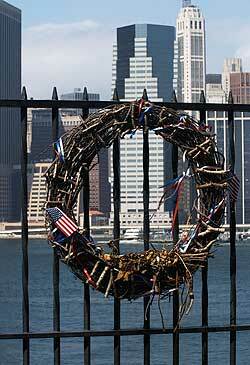 One of the wreaths on the Promenade�s front railing still remains. This unsurpassed view of Lower Manhattan is one of the delights of a walking tour of the Brooklyn Heights neighborhood at the foot of the historic Brooklyn Bridge built in 1883. That Brooklyn Heights is at the foot of the Brooklyn Bridge may be considered misleading because people may think of the �foot� as meaning at water level of the East River, which it isn�t. Even so, the residents in Brooklyn Heights think of the warehouse area at water level as part of their neighborhood. The views of Downtown Manhattan from the waterline either directly under or within a block either way of the Bridge is indeed spectacular and within a three minute walk from the end of the pedestrian path which exits the bridge in Brooklyn. 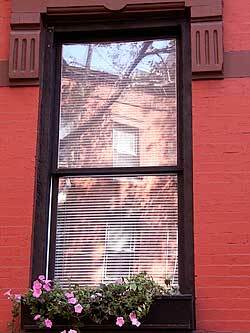 This window of one of Brooklyn Heights� 19th century �brownstones� frames the building across the street. The window-sill planter of petunias is emblematic of the community-minded citizens. This upscale, quiet historic neighborhood is no more than five minutes by subway from Wall Street and is comprised of frame, brownstone and magnificent apartment houses built over a span of more than two hundred years. These tree lined streets are carefully tended by its residents. It can be said that more than one tree grows in Brooklyn! 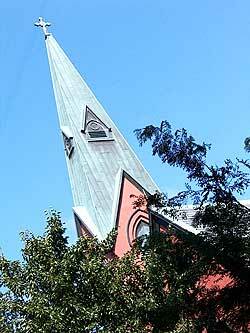 One of many historic churches is St. Charles Borromeo RC Church, on the northeast corner of Sidney and Atken Place, in the historic Brooklyn Heights neighborhood. A different church of great historic significance stands nearby: The Plymouth Church of the Pilgrims (in New England Meeting House Style without exterior or other adornments as befitting the Puritans). It was the setting for the most prominent pastor of the mid-19th century, Henry Ward Beecher (1848-1888) whose support of the abolitionist and women�s suffrage movements made the church an important focal point; a way-station on the Underground Railway prior to and during the Civil War and a �must stop� for Abraham Lincoln, Henry Lloyd Garrison and many others including Charles Dickens. 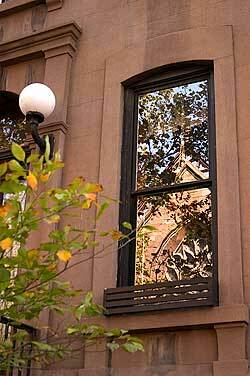 The Grace Church, designed by the noted architect Richard Upjohn in 1847, is reflected in this window in the historic neighborhood of Brooklyn Heights. Hicks Street has many picturesque groupings of attached brownstone family dwellings. The church is set amidst large trees to give the impression of an English parish church. Many of the stained-glass windows are the work of the famed Tiffany Studios. Just around the corner along Grace Court Alley is a unique block-long stand of 19th century carriage houses or �mews� originally designed to house horses and carriages but converted in the first half of the 20th century to elegant residential use. After walking and photographing the lovely streets of Brooklyn Heights, we headed down Flatbush Avenue, the boyhood neighborhood of Woody Allen. 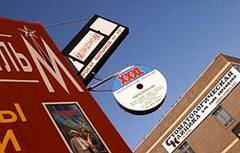 The images of �Radio Days,� the nostalgic movie about growing up in the 1940s in the working class area of Flatbush came immediately to mind as we walked the same sidewalks and looked fondly in the windows of the many shops and delis. Moving from the streets of Brooklyn to the nearby Brooklyn Botanic Garden, we were immediately transported to a different world. Growing from humble beginnings as an ash dump in the late 1800s, the peaceful, lush Brooklyn Botanic Garden has come to represent the very best in urban gardening and horticultural displays. The Garden�s history begins with a modest act on the part of the New York State Legislature shortly before the turn of the century: They set aside the 39 original acres for a botanic garden. In 1910, the Garden was founded and Charles Stuart Gager was appointed the first director. Significantly, in 1914, a landmark Children�s Garden program was started. A year later, the Japanese Hill-and-Pond Garden was completed by eminent landscape architect Takeo Shiota. 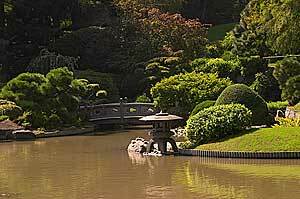 The Japanese Garden includes a Shinto shrine and a man-made ravine and waterfall on its upper levels. Stone steps placed in the lake also connect a tiny man-made island. This construct is a common feature in Japanese gardens, along with the typical lattice-work teahouse, moon gate and bamboo and wood fences topped by narrow caps in the style of Japanese pagodas. 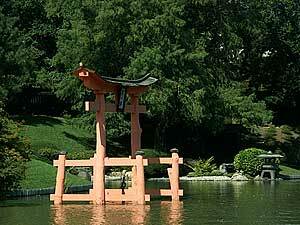 The Torii or Gate in the lake of the Japanese �Niwa� in the Brooklyn Botanic Garden has a hill-and-pond and stroll-garden style environment. The Niwa was designed and constructed in 1914. Takeo Shiota, the landscape architect, was motivated by an ambition to create �a garden more beautiful than all others in the world.� This garden�s simplicity and �harmonious asymmetry� was created around a lake shaped like the Chinese letter meaning �heart,� the center of meditative calm. The Japanese Garden also complements a collection of Japanese Flowering Cherry trees with over forty varieties which in its diversity is the largest in the western world. Especially noteworthy are more than seventy-five of such trees of the pink, double-flowering Kanzan species which are the center point of Cherry Blossom Week at the Brooklyn Botanic Garden. They blossom toward the end of April or early May � call to make sure when the trees are expected to bloom, as unpredictable weather conditions significantly influence the dates. After taking a brief break for lunch at the Garden caf� (and to rest our tired �dogs�), our energetic guide, Dave, wanted to show us more of the borough. So, off we trekked to see what he had in store for us. We wandered west through Brighton Beach, currently an enclave of Russian �migr�s. This newspaper stand is one of the many businesses on Brighton Beach Avenue in the shadows of the elevated subway line. 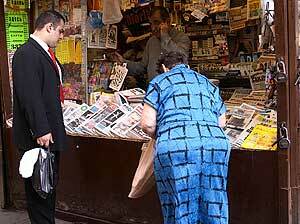 The newsstand, like others in the neighborhood, features newspapers and magazines catering to its overwhelmingly Russian-speaking population. Colorful displays of commercial messages, signs and logos in Russian are found on and atop every store and building along this thoroughfare. It is rare to find any English in the tiny stores or restaurants in this area. The local movie theater features only Russian language movies. 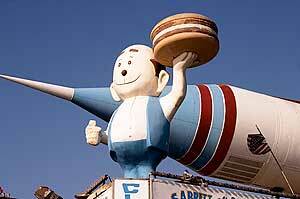 At the end of our walking tour, we visited the famed Coney Island � the legendary New York amusement park. Gaudy signage adorns the concession stands along the �Boardwalk� in Coney Island. Famous features of this amusement park include the Wonder Wheel, the century old wooden Cyclone roller-coaster and the remnants of the Parachute Jump at the site of the former Steeplechase Amusement Park. Today, only a honky-tonk atmosphere exists in Coney Island, however, the original �Famous Nathan�s� hot dog stand is still going strong. Adjacent to the park is a broad beach where you literally �walk on boards,� hence the name �boardwalk.� This walk is a couple of miles long, including that serving the adjacent Brighton Beach and is packed with up to a million bathers on a hot weekend in the summertime. The smell of salt water and refreshing breezes are the main attractions of an area that was in its hey-day between the turn of the l9th Century and until shortly after World War II. Already in the works is another exhilarating excursion with our intrepid BAG guide, Dave. We can�t wait to return and discover the off the beaten path experiences only the �locals� can show you. Nancy & Steve Ross are a dynamic duo and work side by side photographing, writing and editing their work. When they are not on location photographing, they are editing their images and words. Some would say that this wife/husband team are joined at the hip! Their work has appeared in many publications as well as in galleries. They have made the move to digital photography, but still use film on occasion. They are members of North American Travel Journalists (NATJA) and write a bi-monthly "Photo Tips" column for Travelworld Magazine. One of Nancy's photographs was selected as a winner from over 12,000 entries in the 2004 Smithsonian Magazine Photo Contest. See it at Smithsonian Photocontest.